Jay B. Lubliner, DMD provides cosmetic dentistry in Massapequa, NY. Call 516-798-0223 to learn more and schedule your appointment today. As specialists in cosmetic dentistry, our services include porcelain laminate veneers, teeth whitening, removable and fixed dentures and ceramic restorations including crowns and bridges. 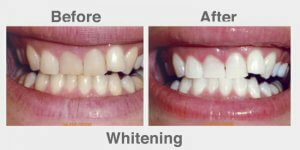 Let us transform your smile! Porcelain veneers are thin pieces of porcelain used to recreate the natural look of teeth. 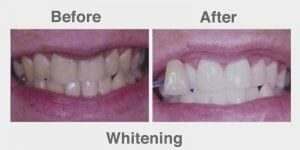 Veneers can be used to change the size, shape, color and position of teeth. To place a veneer, a very small amount of the original tooth enamel must be removed. Afterwards, an adhesive layer is placed between the slightly prepped tooth and the veneer. The veneer is then hardened with a curing light. A crown is a dental restoration that completely covers the outside of a severely decayed tooth. While crowns can be made of a variety of materials, most of the crowns we place in our office are all porcelain, metal free and computer milled, which provides for the most aesthetic look and the best possible fit. Dental crowns can be completed in two visits. During the first visit, the tooth is prepped (shaved down) and an impression is taken. A temporary crown is placed while the permanent crown is being made. During the second visit, the permanent crown is fitted comfortably and then cemented into place for a permanent restoration. Complete (Full) Dentures are made after all the teeth in the upper and/or lower jaw have been removed and the gum tissue has healed. The denture includes an acrylic base that is custom made in the dental laboratory and is made to look like natural gums. The denture sits over the gums or can be anchored to dental implants for additional comfort and support. If multiple teeth need to be removed, immediate dentures can be made ahead of time so that our patients are never without teeth. Removable Partial Dentures are made when only a few teeth need to be replaced. They most commonly consist of teeth that are attached to either a metal or acrylic base. Often there are clasps, which are disguised or hidden for cosmetics, that hook on to the patient’s own teeth. All our fillings are done using a tooth colored composite material (metal and mercury free). These fillings are more aesthetic, tend to be less sensitive and they better adhere to the tooth’s surface than conventional amalgam fillings. Teeth over time will darken and stain. ZOOM!® Whitening, a form of bleaching, is an in-office procedure used to remove much of this stain and brighten your smile. 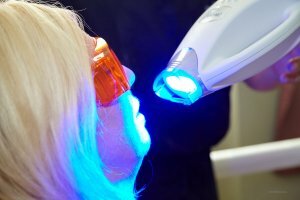 It uses a specialized LED light to activate a whitening agent on the surface of the teeth, helping to lift the stain out of the enamel surface. 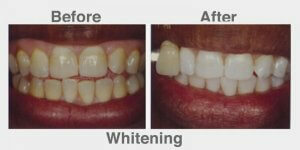 This results in a whiter, brighter more youthful smile. Most people will lighten 6 to 8 shades with a single session. There are numerous options for improving your smile, including tooth whitening, crowns, bridges, porcelain veneers, dental implants, and more. Dr. Lubliner will perform a detailed examination and assessment of your existing smile, and make a professional recommendation. Depending on your individual needs, your treatment plan may include more than one solution. You may also be offered different options from which to choose. Does cosmetic dentistry cost a lot? Everyone has different needs, but many people are pleased to learn that they can obtain a beautiful smile for a fraction of the price that they expected. We will work hard to develop a treatment plan that works with your budget. In addition, we provide qualified customers interest-free financing through Care Credit. Although dental insurance can be confusing, and every policy is different, many dental insurance plans provide partial coverage for certain cosmetic procedures if you meet specific criteria. Our friendly front desk staff will help you understand your out of pocket costs before we begin work. Click on the link below to view our amazing transformations!